When I get busy, I tend to reach for higher carb breakfasts because they are quick to prepare and I don’t have to think – a bowl of cereal, oatmeal, yogurt with fruit – even though I know I feel more energized and my glucose numbers are better if I have enough protein at each meal. I’ve been insanely busy lately, but I finally took a breath and decided I needed to pay more attention to breakfast. One of my go-to breakfasts when I didn’t care too much about my diet was my version of an Egg McMuffin – basically eggs, cheese and meat on a toasted English muffin. This recipe is a healthier version of my old masterpiece. I’ve lightened it up by using a combination of eggs and egg whites, replacing regular cheese with low-fat and throwing out the English muffin in favor of a thin whole-wheat bagel. This sandwich contains Riboflavin, Calcium, Phosphorus and Selenium and will give you a good boost of Protein and Vitamin C. It is a bit high in Saturated Fat and Cholesterol. If you are watching your fat and cholesterol intake, use all egg whites or an egg substitute such as Egg Beaters. Melt butter spread in skillet over medium-low heat. Add green pepper and onion; sauté until soft. In a small bowl, whisk together eggs, egg whites and pepper. Add to skillet and cook until eggs are set. Divide egg mixture in skillet into two piles and use spatula to make them into round shapes, approximately the size of the bagels. Place a slice of cheese on top of each. Turn off heat and cover skillet. Toast bagels. By the time the bagels are ready, the cheese should be melted on top of the eggs. 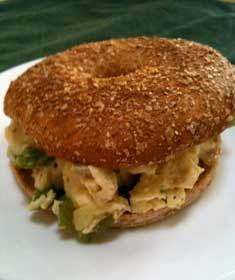 Put one pile of eggs and cheese on each bagel.